Sea over at the always-enlightening and droolworthy blog, The Book of Yum, has a gluten-free blogging event under way. The idea is to familiarize more gluten-free folks about the wealth of safe, delicious recipes by having people "adopt" their favorite gluten-free blog. 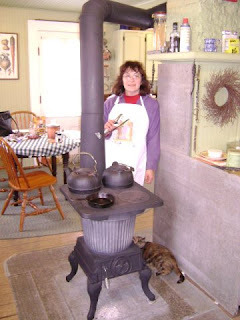 Then we each have to cook up a recipe from this blog within the next two weeks and link up to Sea's website. The Vegetable Kingdom, specifically the cruciferous family, exhibited mind control over Dan and I yesterday as we each returned from separate trips to the supermarket with a head of cabbage and bag of broccoli. 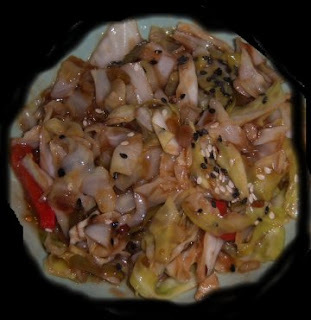 My head of cabbage telepathically ordered me to my recipe card file to make this delicious stir-fry. Resistance was futile. Wrestle control from the cabbage and chop coarsely. Heat oil in large frying pan or wok and then stir in scallions and garlic. Stir for 2 minutes, then add peppers. Saute until softened. Add cabbage and saute again until softened. Add vinegar, soy, sugar and red pepper flakes. Simmer, covered, 3 minutes. Add cornstarch mixture and quickly stir for 1-2 minutes, until sauce is thickened. I sprinkled the top with a mix of white and black sesame seeds for color, but this is optional. Always listen to your vegetables. One of the perks of owning a used bookstore is that you have first dibs on any of the books that come in. Sometimes they are just for borrowing and reading (eventually I hope to make my way through my own book collection), but many times they are keepers. One such cookbook is "The Modern Vegetarian Kitchen", by Peter Berley (NY: Regan Books, 2000), which is 450 pages of enthusiastic and cleanly-written and laid-out cooking ideas for the meatless kitchen. It received several publishing accolades, including a coveted James Beard Foundation Cookbook Award. Slice tofu in half horizontally, then slice each piece in half. Whisk together barbecue marinade of vinegar, soy, oil, maple syrup and spices. Pour half of marinade into a 10 x 15 glass baking dish. Lay on tempeh and then pour on rest of marinade. Cover dish with foil, shiny side down, forming a tight seal. Bake 1 hour and 15 minutes, until most of marinade is absorbed. Uncover last 15 minutes in the oven. 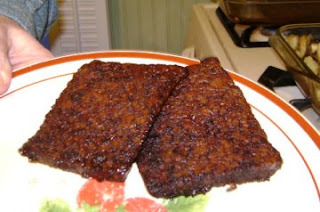 Remove tempeh to a plate to cool. Great as a main dish with rice or cooled as a sandwich filling. I received a lovely apron from Karina's shop at the Gluten-Free Goddess website and am very pleased. 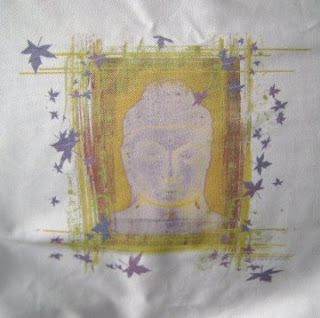 I picked out a great Buddah design apron and have been cooking up gluten-free delights in it ever since. It fits and washes up well and has two small pockets in front, which helps when creating in the kitchen. There are lots of great gluten-free designs for T-shirts, magnets, baby attire, shopping bags, coffee mugs and other items fit for a goddess at Karina's site, so I would encourage you to check them out. They make lovely gifts for others and even for one's self! This suspicious looking character showed up in my kitchen and started getting fresh...so I whacked him. 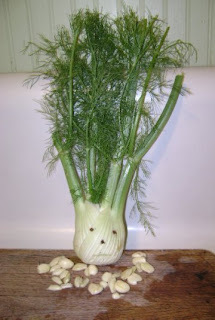 To torture this noir pastiche no longer, I will say that I love fresh fennel. I haven't had success growing this potherb in the garden, but I like to buy an occasional bulb and slice it up into salads or just munch it raw. It has a delicate anise flavor, but otherwise resembles celery in crunch and preparation. I used a recipe for traditional Italian sauteed fennel, or Finocchio al Oglio e Aglio (Fennel with Olive Oil and Garlic) and took it a few steps further to make an accompaniment for our broiled fish supper. This dish would also be great paired with polenta or atop rice. The anise taste of the fennel still lingers, but it's richer and mellower when paired with its fungal friends. Heat oil in saute pan. Add garlic and stir around the pan for 1 minute. 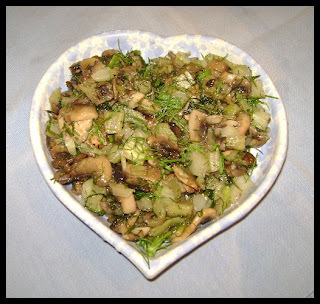 Add diced fennel and mushrooms and saute until soft, about 8 minutes. Season with salt and pepper. Stir in chopped fennel fronds.